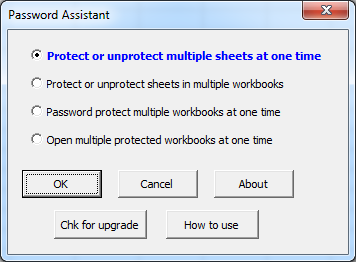 The Password Assistant add-in for Microsoft Excel allows you to password protect or password un-protect multiple worksheets at the same time with the same password. The Password Assistant cannot recover lost passwords to worksheets or to workbooks. The menus are easy to follow and use. And to help you learn how to use the features of the Password Assistant there is a help and exercise file to give you hands on practice. Sheet Navigator - Move from sheet to sheet with great ease. View a list of all your sheets with one click!